Originally webhooks are a not really standardized way to avoid excessive polling of the progress state by system A which waits for some data of system B in the manner that B just notifies A when it has finished the calculation. 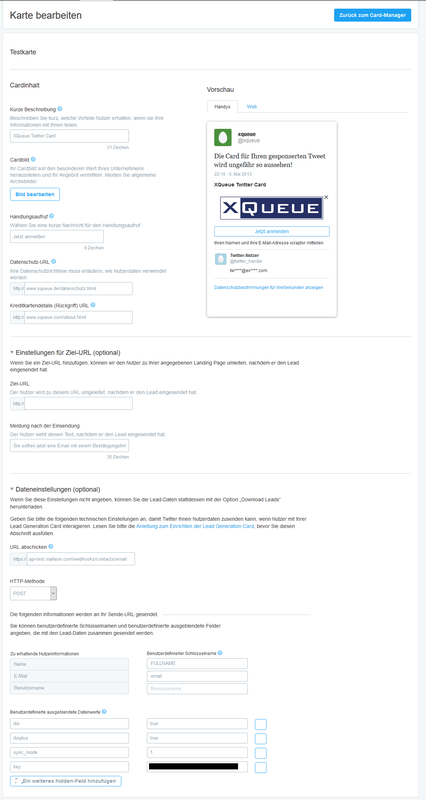 Maileon webhooks can be used from third party applications like Twitter to set up forms that allow setting up registration forms and submittinc contacts to maileon. A webhook is triggered by sending a POST request to a given URL while providing parameters that specify the data for the action to take. As the data submission is not exactly standardized, different external application use different „standards“ and it is important to know, that we have carefully designed the api to be as safe as possible. Only SSL connections are allowed (using HTTPS). This means, it does not matter if the data is submitted as URL-parameters or in the body: they are encryped. The data format of the API is JSON. Complex data will be submitted as JSON and response information (also error messages) will be sumbitted as JSON either (Mime-Type: application/json). In this case all data is set as URL-parameters. Make sure to URL-encode the data. It is possible to submit the data partially as URL-parameters and partially, or completely, as an associative array in a JSON-Body. IMPORTANT: if a value is set as URL-parameter AND in the body, the body value will override the URL-parameter! Some applications use this content type and submit the URL-parameter string in the body. Creating a contact uses the same configuration possibilities as with our REST-API. Please remember: all the followinf parameters can be used as URL-parameters and in an associative array in the body of the request. Important: the fieldname must be written exactly as specified in Maileon (upper and lower case) but must be URL-encoded, e.g. a space must be replaced by a +, etc. Description: Specifies the initial permission to be assigned to the contact. Please note: this is the initial permission that is assigned to the contact as soon as it is created. If a double-opt-in process is triggered, the permission is changed to DOI or DOI+ after the contact used the acknowledgement link in the DOI mailing. If the same contact is registered again after already acknowledging the DOI link (and thus, already has Permission 4 or 5) and you call this method with any other permission then 4 or 5 (less valuable), the permission will be ignored, since you already own a valid DOI(+) permission. Description: Tells whether a double opt-in process should be started for the created contact. Note that the status code returned for this request does not mean that the doi process succeeded. Supported values are true and false. Description: This parameter is ignored if doi is not provided or false. In case the doi process succeeds, Maileon will be allowed to track opens and clicks of the contact. Description: This parameter is ignored if doi is not provided or false. References the doi mailing to be used. If not provided, the default doi mailing will be used. Description: Specifies the synchronization option in case a contact with the provided email address already exists. Description: A string intended to describe the source of the contact. If provided, the string will be stored with the doi process. Description: In case where this method was called by a subscription page, this string offers the possibility to keep track of it for use in reports. This code is the default if everything worked well. This code is returned if there has been an error processing the data. Usually this happens if e.g. a not valid email has been specified (e.g. 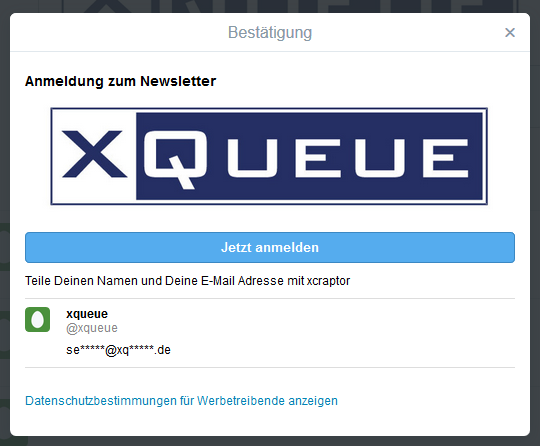 max.mustermannQxqueue.com) of a non existing custom field has been specified. In case none or an invalid API-key has been submitted, this code will bereturned. This is the code we do not expect to happen but if there is something unexpectedgoing wrong, this code will be returned. Create a contact using the given email address, firstname, lastname the custom field „special date“ and send the DOI mail with the key „dh6hdjk9“versenden. The contact will get DOI+ after klicking on the confirmation link in the mail. Ever wondered how to connect your Twitter followers with your newsletter easily? Well, how about Twitter Cards? 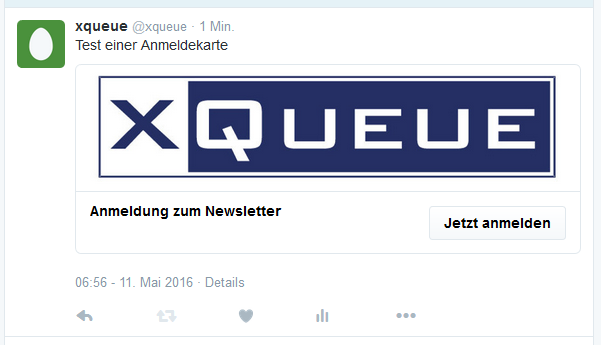 Using Twitter ads you can set up a card with the offer to register to your newsletter for other registered customers following your stream.